I am looking at JGS rankings and how there calculated. It looks like they my have tweaked them again this year. I am sure this happens all the time because a lot people are gaming the system when they can. Some things I noticed when start to look at the numbers deeper. The biggest gainer in the beginning is lower average score. I believe this accounts for 65%. To me it looks like the lower your average is relative to par and slope the better your ranking is going to be. Also since the bottom scores ( I seen two numbers 25% or 15%) doesn't count the more tournaments you play the lower your score is going to get. Winning or placing in tournaments may matters more then strength of field. From what I see you can beat some kids all the time in large tournaments but if they play small tournaments and win they get a boost in rankings. The above is really only for girls above 1000 and probably boys above 2500 levels to get below that you need to play higher ranking invitational tournaments ( By this time you are already on the road to rank well). I also seen Moving up too early will kill your ranking and I seen that more then once. However playing up a few tournaments will actually help it because it will increase strength of tournament but the scores will not count . It's all very confusing and a lot half truths which makes it hard to navigate. I don't think there have been any big changes other than they are now counting completed rounds when there was a non-JWD withdrawal. 1. Scoring counts for 65%. They use the best 75% of a player's completed rounds, compared to the course rating. I don't think slope is a factor. 2. Strength of field counts for 25%. It definitely makes a difference as they get older and move up. 3. Strength of finish counts for 10%. I have never been able to understand whether this makes much difference at all. The reason I mention slope is I been able to calculate the differential pretty close using a handicap calculator. Not perfect but good enough to predict. Seems odd that seems to work well and it would be an easy thing to use. So I am thinking this is how they calculate the differential in the rankings. It also seems that it might be 15% not 25% that is not used or they are rounding down the number of tournaments do not use in a profile to calculate differential average I seen both numbers used loosely on their site. The rounds seem to be calculated on individual basis and makes placing in tournaments less of an issue. It's also the reason why I say moving up too early can hurt ranking since a lot times kids will end up scoring higher even though may benefit from strength of field points. The strength of field seems to really only matter on the type of tournaments you play. You can beat players in every tournament but will not be ranked as high for what ever reason. In many cases the difference is usually because they played in tournaments locally and won and perhaps got lower scores in those tournaments. From what I can tell the algorithm has no care who actually played in the tournament. It appears to me that tournaments are ranked by JGS to determine strength of field and use an internal number. You can playing nothing but local and state run evens and be ranked top 400 if you are in the right states. You absolutely do not have to play invitationals to be ranked top 2500. That is what I am saying to rank high you don't need to travel just score low and win local tournaments. Would not be surprised girls could go as high as 400 either. I used 1000 because I seen kids that have low strength of tournament numbers but still rank around 1000. Not sure how much lower they could go without playing higher tournaments. From what I see getting low scores and winning will move you up the rankings faster then anything. The scoring differential is the difference in the course rating and the score. Par has nothing to do with it. You can look at JGS Search Tournaments tool to see what JGS used as the course rating. The course rating is not what SFPGA, FJT, or AJGA says it is. The course rating is what JGS says it is. It is important to understand the scoring differential. If you play in a tournament and the Scoring Differential is a 66 and you shoot a 72 then the scoring differential is a 6. If you play in a tournament and the scoring differential is a 75 and you shoot an 80 the scoring differential is a 5. That 80 is a better score in this case to help the ranking. Strength of field is how deep the field is and the quality of the field. Basically, you don't want to play in tournaments that is going to attract a field of 10 or less kids. Although at times this is hard to avoid. I have long stated that after US Kids World's at 12 there is no reason to play in US Kids events. The course ratings are very low because US Kid's distances are short. The strength of the field at the State and Regional levels are low. Knowing what tournaments to play in is a big deal. 100% Agree. You are not going to play an Invitational unless you are Top 5 in your state (Florida, Texas, California) depending on the state . I didn't say top 5 in the class. I mean Top 5 over all classifications regardless of graduating class. 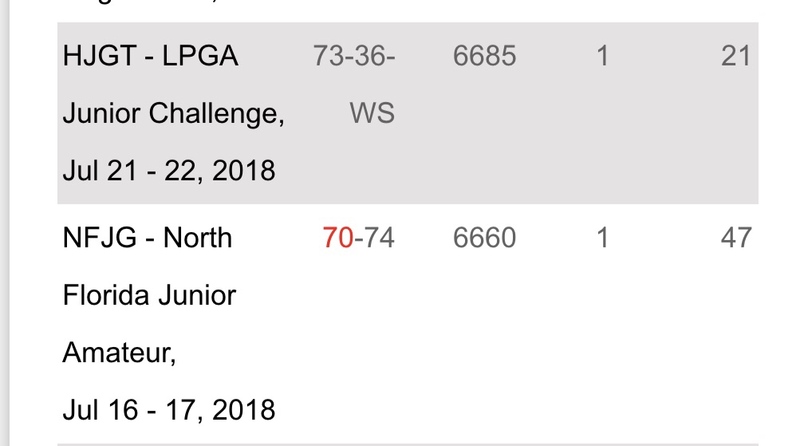 The 19th ranked girl in 2023 class (400ish overall as an 8th header) has played one AJGA event and it was a preview. All the rest of her counting events are FJTs. The FJT events she’s won have much stronger fields than the AJGA preview. She will get to choose where she goes to school. I am well aware it is the course rating that matters the most reason I used par is to simplify things a bit. Keeping it simple is better. I also don’t think the number of kids play much into the scores either. It may have some rating but it seems like they assign tournaments a score. If your starting out just score as low as you can the ranking will follow. It also doesn’t matter ithat much if your consistent in the same tournament. Just need a low average and play more tournaments. A lot of times I will hear, 'play in the right tournaments' but nobody ever defines what the right tournaments are. Are those tournaments that you think your junior golfer will place well in, score well in, showcase their ability, have more AJGA stars to give, will rank them higher on JGS???? How does anyone know this stuff that hasn't already been through it? What you saying is what confuses me as well everyone says the correct tournaments. Looking at the highest ranked kids you see them all in the same tournaments. The problem is a junior starting out will never get in those tournaments unless there ranked high enough in a lot cases. This is why ranking even matters in the first place. With JGS I could easily spend 10k traveling around the country to play in the right tournaments. I am not sure any of that matters after looking at rankings of kids. Some kids seem to do just fine with ranking playing local tournaments that are ranked. The biggest issue I do see is that the lowest rounds count not tournaments. It very easy to have kids who will score 85 one round and 78 the next round to rank above kids that score 80 on both rounds. It’s a major flaw in their rankings because in 2 day or more tournaments every stroke counts and usually the more consistent golfer will beat the golfer one with wild day to day fluctuations in score. If playing in the same events that would literally never happen. You’re making it way kore complicated than it is. Scoring differential is majority of ranking so obviously the players shooting lower scores, even in weaker events, can be ranked higher. I’ve been saying this, no reason to travel the US playing AJGAs unless you are ranked top 100 overall and really wanna play in invitationals. There are top ranked college golfers who never played a single AJGA event. A lot people travel all over the place for rankings. In some cases I have seen it work too well and seen kids skyrocket much higher then they should be. Most kids don't play in the exact same events every time from experience so rankings are going to be different. Sometimes there are kids ranked a lot higher then others and I can almost guarantee that lower ranked kids will beat them and have every time. JGS is not as simple as you make it out to be. When a kid is 11-14 you can probably just play what ever tournament you want and if they score low enough you ranking is going to be pretty good. The issue is from 14-18 if you don't understand how it works your not going to rank well period. This should be obvious to any parent who has kids in Junior golf. To me a slow steady rise seems like the best approach. Maybe off topic but does anyone know how weather shortened events are handled? For instance, play 18 on day one and then only 9 on day two. Just because many parents are ignorant and overspend playing all over the US doesn’t mean it’s necessary or the right thing to do. They used to not count the entire tournament. Now they don't count the round if shortened by the rain. This is where you use the JGS to do your research. In Florida, the best tour to play on is the FJT because they have the best and deepest tournament fields. When the schedule comes out I will make a spreadsheet of the location of all of the tournaments. I then go to JGS and find the tournaments in the Search for Tournaments tool bar. I first look for the course rating and then I look to see how the field scored against that course rating. I may go back several years looking at the tournament scores. I then look to see how many scores in the red. Using this knowledge I will determine the tournament schedule. At the end of the day, you do not need to travel the country to play in events, especially if you are a girl. You do not have to play AJGA if you are a girl. This is about the only way to try and game the JGS system. Because their system relies so heavily on score relative to course rating (slope is not included), the only way to strategically plan tournaments is by identifying events where historically scores are lower relative to course rating. If, like Heavy Hitter said, you make these choices from a group of events that are already relatively strong, then you handle the strength of field aspect as well. But JGS, as a whole, can not be gamed. Your ranking improves as your scores improved. There's a player in Arizona who is top 70 overall on JGS who has never played an event outside the JGAA, but he goes low on a regular basis and, somewhat similar to the FJT, the JGAA has some pretty decent fields. And individual events/tours are NOT able to beat the JGS system. Last week I turned in our scores for the Gator Invitational. Because of some course construction we played 3 of the holes differently than we would normally. We had the MS Golf Association calculate a course rating specifically for our event based on the tees we were playing but JGS used some sort of USGA database and changed the course rating from 73.3 that we turned in to 73.7. Worked well for our players. I wouldn't necessarily call it gaming the system. It is being smart about it the tournaments you play in. FJT plays at the Mark Bostick every year in Gainesville as a 54 Hole Major in January. End of January in North Florida we are talking cold and windy. When you look at the previous years scores you see a course rating of 70.6 and 80% of the field shooting at LEAST one day in the 80's. This is a common theme among all age groups, male or female since the inception of this event. No total score at or under par. Very few scores in the red. 2019 there were 3 scores under par out of 162 posted. 2018 4 scores in the red out of 222 posted. 2017 was a two day event and 1 score out 114 in the red were posted. It honestly makes no sense to play in this event from a standpoint of rankings. There are really good top 500 players in this event. This is an event full of good players year in and year out and the scenario is always the same. My buddies daughter played this year and I told him he was making a mistake by playing her. Sure enough went all three days in the 80's. This from a girl who just won a big FJT event, came in 2nd in another and is a major college prospect because she carries the ball 250. I honestly don't think it is the course, I think it is the event with the conditions in North Florida at that time of year. Another scenario is playing any event at Old Corkscrew in Ft. Myers. I would never go an play an event at that course. The course is a beautiful Nicklaus design and it is a nice facility. Course rating is a 73.9. It is one of the hardest courses I have ever seen and some of the hardest putting greens I have ever seen. More than 50% of the field is putting up two days in the 80's. Had a conversation with a D1 college coach while watching my daughter play in an event there. She said "We only come over and play this course when I want my girl's to purposely shoot in the 80's." You have to play in the correct events. This is really interesting and makes a lot of sense. 1) what age do you think this type of "ranking management" (where you selectively play courses/events to minimize scoring differential in order to maximize ranking) should start? 2) do you think this could impede long term development in any way? Honestly, probably more important to hawk rankings early in the process so as to get on coaches radar. Once you’re on the radar they are going to evaluate you more in person. If, at 13 years old, you can be top 50 in your class instead of top 100 (which is only a difference of about 2.5 strokes per round) then you’ll find yourself on more radars. It honestly depends on where you live and the distances being played. 11-12 year old males in Florida are playing in events that are no more than 5800 yards. You will seldom have a course rating over a 68 for a boy playing from that distance. In that age bracket I would just play in whatever is close and inexpensive with no regard to course ratings or the quality of the field. Once boy's hit 13 they are jumping up to 6500 yards and course ratings of 70+. I think this is when you start to manage the tournaments. Another point ... while JGS is definitely relevant, once a player reaches 13-14 or so, the Rolex rankings come into play if playing in invitationals is the goal. you right there is not much need to travel much under 13. The chances of getting into a AJGA or other event is small and any bump in ratings from playing those events will be lost when other kids start playing them the same age. Here florida the FJT for 11-12 is only 5000 yards for girls. It very short and almost any girl that age can reach the greens in two. When there 13 it jumps up to closer to 5800-6000 yards. Doesn't sound like much but some girls will never have the distance to reach in regulation half the holes. Most girls this age will actually rank better from staying the short distance for as long as they can. Some older kids would who can not hit greens in regulation because they can not carry the ball enough should probably play winter tournaments in places such as Dallas where in February through March where the ball will roll a long distance and you get an extra 50-100 yards. I disagree with your entire premise on rankings. I don't think you understand how they actually work or what events kids need to play in. 5800-6000 yards is easily played by driving the ball at 200 yards. I saw a young Pano not reaching greens in two playing 5800 yards and shooting at or under par. Her short game and putting was incredible. Playing shorter distances will not help a ranking unless you can shoot under par, or at the course rating. There isn't one girl in the country that has to play AJGA to get noticed. A girl in Florida can sit on the FJT circuit and be recruited by any school in the country if she puts up scores. Now, if you want to be the number 1 junior golf in the country, you need to play AJGA. If that isn't your goal, you simply don't need it. JGS - shoot lower scores and try to play against strong players. But, mainly, shoot other scores. AJGA/Rolex - Beat other players. The number you shoot doesn't matter but how many players you beat does. How do you beat other players? Shoot lower scores. So, in summation, if you want your junior to "skyrocket" up the rankings, then that player needs to shoot lower scores and beat other players, preferably better players. This really isn't complicated. Heavy Hitter earlier touched on a way to gain a slight advantage on JGS, but even that doesn't help if you can't score well and beat other players. Have you actually seen how far the average 11-12 year girl hits a driver. Most them are lucky to get anywhere close to 200 yards. I would think the average is maybe 180. They are using long irons if there lucky to hit a short par 4 at 6000 yards. A lot then will get longer but it will take time. For some just like boys there never going to have distance. Your going to have a hard time convincing any college coach you can par a hole and at best drive 200. Especially with today’s tech and ball. You may not need to play AJGA to play a bottom tier college but if you want to pick and have decent school you probably should be trying to play AJGA by the time your 14 or 15. With all things equal most people would agree play AJGA and USGA if you can and still be competitive.